Like so many Americans, perhaps you've been thinking you really have to replace your old car this year. Well, looks like June might be a good time to get that high-MPG vehicle as a (lightly) used car. According to the NADA Used Car Guide, as gas prices have come down recently, so have the prices of fuel-efficient used cars--which had risen more than 10 percent from January through May. The guide, issued monthly by the National Automobile Dealers Association, projects prices for used cars based on actual sales, market trends, gas prices, new-car sales, and a host of other factors. Prices of compact and mid-size vehicles are expected to fall as much as 5 percent next month, NADA said. And it expects further drops through the summer, assuming gas prices stay at roughly their current level. 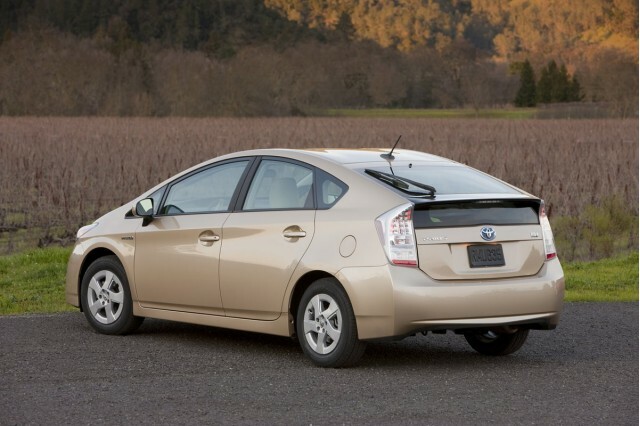 Some of the best news has to do with the Toyota Prius hybrid. The price of a one-year-old 2011 Toyota Prius liftback is expected to drop fully $900 next month alone--though that drop only makes up for about 40 percent of its $2,350 gain since January. Causes include fuel economy fading in car buyers' minds, a slight move from sedans back toward light trucks, and Toyota dealers with full stocks of the new and expanded 2012 Prius family at last, following last year's earthquake and tsunami in Japan. The NADA Guide projections were reported by The Detroit News and numerous other outlets. The NADA Guide also projected prices prices for used Nissan Leaf and used Chevrolet Volt electric cars for the first time, saying that the cars would retain 90 percent of more of their post-incentive cost after one year.